GER series Used engine oil regeneration system is particularly suitable to regenerate used internal-combustion engine oil including diesel engine oil, gasoline engine oil and used hydraulic oil, other used machinery’s lubrication oil. 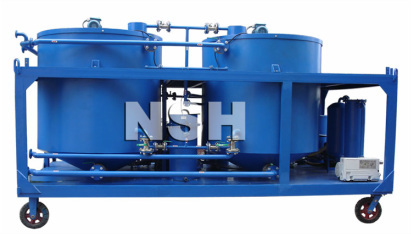 GER series are able to effectively remove colloid, oxid, acid, pitch, particles, impurities, water, gas in the used oil. Specially, GER can restore the color of used oil and remove the scent rapidly. 1. Adopting high-precision stainless steel strainer with excellent mechanical intensity and long service life, which is corrosion-resistant and high-temperature-resistant. 2. Two main filtering systems can ensure the GER works continuously by batch. 3. Completely removing water and harmful gas from the waste oil and recovering the color of the treated oil as fresh oil. 5. Low operation cost and maintenance, replacement expenses. 6. Environmentally friendly, no acid used during operation. 7. Heat preservation material which can keep heating high efficient and lower operation cost. 8. High performance security system including pressure protection device and automatic temperature controller makes purifier operate safely. 9. Exhaust gas processing system can treat exhaust gas quickly and efficiently and make operation more environmentally friendly.